In a medium size skillet, heat the EVOO over medium-high heat. Add the red bell pepper and zucchini and cook until crisp-tender, about 3 minutes. Add the spinach and chicken and cook until heated through, about 3 minutes. Meanwhile, place the tortillas between two damp paper towels and microwave for 15-20 seconds. Fill each warmed tortilla with a quarter of the vegetable-chicken mixture. 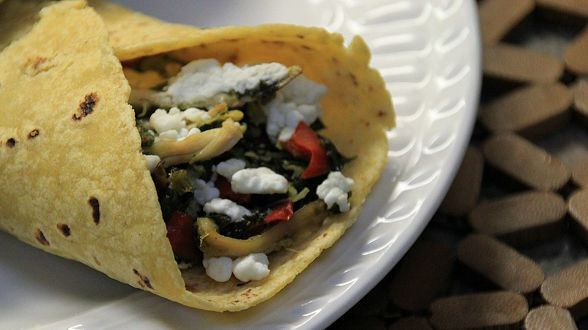 Top with the queso fresco and roll up to serve. In Recipes-list.com we have selected the most viewed recipes from category - uncategorized . Enjoy the best recipes specially selected for you! April Showers Bring May…Flautas is the right choice that will satisfy all your claims.